Fireplace screensaver features a wood burning fire place with a crackling flames sound and brings the same comfortable ambience of a real roaring fireplace. Download and try for free one of the most realistic fireplace screensavers for Windows 10. 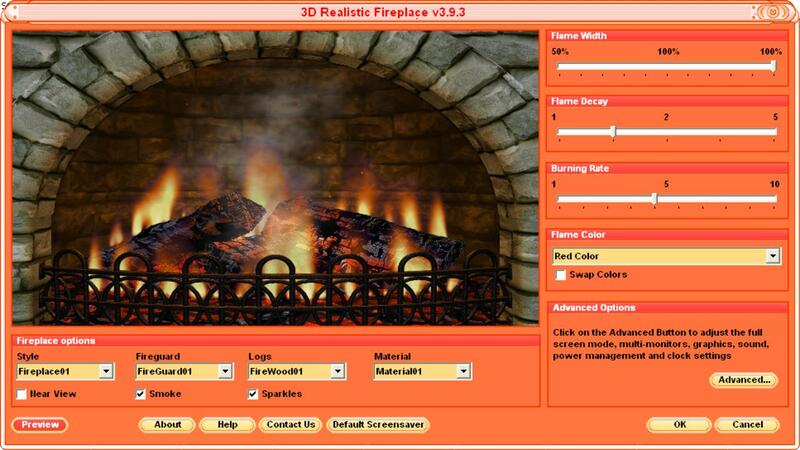 Download fireplace Screen Saver with 3D animated fireplace and crackling fire sound to transform your computer screen or widescreen plasma TV into one of the best animated virtual fireplace Screen Savers. Free Screen Saver downloads are available for Windows 7/8/10/XP. 3D Animated fireplace Screen Saver provides an unmatched elegant look of a wood burning fireplace and supply charm and comfort to your home or office year round. You can have the warmth, ambiance and romance of a real fireplace, wherever and whenever you want. 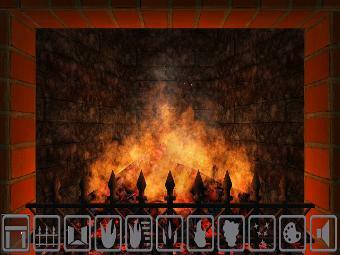 The burning fireplace settings includes many options for your customization. 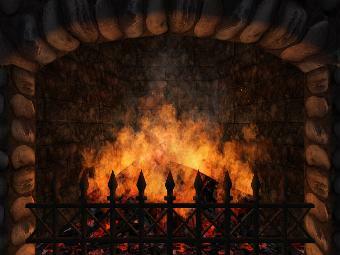 You can choose from several burning logs, styles, materials, and fireguards. The fire controls allows you to adjust the color, width and height of moving flame animation from roaring fire to glowing embers. You will hear real sounds of the snap, crackle, and pop of a roaring fire. The realistic sound effects from the burning logs are very soothing and create a very warm background ambience. Together with the flickering sparkles and moving smoke, it creates the perfect atmosphere for social and romantic occasions. In the warm glow of the firelight, you recreate the atmosphere of those memorable gatherings around the real camp fire. Time is at the core of your business, and tracking it is critical. Free 3D clock will help you track your time easily and accurately. The digital screen saver clock displays current year, month, day, hours and minutes. You can select from 12/24 hour mode and adjust color of digital clock and calendar. Ideal for everyday enjoyment or entertainment, this 3D fireplace looks better than the real video or DVD! 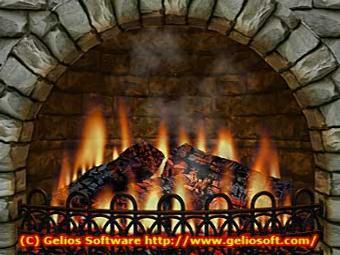 When you buy, full version of realistic fireplace 3D Screen Saver can be downloaded immediately. A small file size makes it an easy download to your computer desktop. Our ecommerce providers ensures that you get your full version as soon as possible, making purchase based on your own familiar currency and payment method. Enjoy the Benefits of the Full Version Now!